SAINT JOHN – A longtime historic landmark in Saint John’s South End has been recognized for its cutting-edge energy efficiency. The Ordnance Building, professionally managed by Commercial Properties, has been named among the first ENERGY STAR® certified buildings in Canada and was the only building in New Brunswick to be certified among the first. The certification acknowledges the building’s superior energy performance over a 12-month period, which ranks among the top 25 per cent of similar buildings nationwide. ENERGY STAR certified buildings give off 35 per cent fewer greenhouse gas emissions than typical buildings. “Congratulations to Commercial Properties, whose Ordnance Building was among the first to qualify for ENERGY STAR certification in Canada. 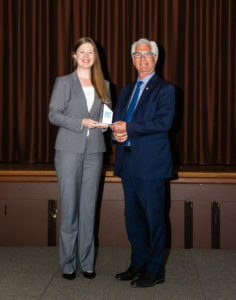 Energy-efficient buildings play a key role in helping Canada achieve its greenhouse gas reduction commitments, and we are proud to recognize organizations that are leading the way,” said the Honourable Jim Carr, Canada’s Minister of Natural Resources. Already a well-established benchmark for household products and homes, ENERGY STAR represents a partnership between the Government of Canada and public, private, and non-profit organizations to promote energy efficiency. It was designed to help Canadians make better choices by guiding them towards products, homes, buildings and industrial facilities that will help them save money and fight climate change. A national historic landmark, the Ordnance Building was built in 1842 and survived the Great Fire of 1877 which destroyed most of the city. It has served an important role for the Canadian military since its construction, housing weapons and military supplies through two world wars. Now home to premium office space, it has been restored in keeping with its original character while blending contemporary style. ENERGY STAR Canada is a 17-year-long energy efficiency success story. The program is a voluntary partnership between the Government of Canada and 1,500+ organizations working to use our natural resources more wisely through greater energy efficiency. Behind each ENERGY STAR label is a product, home, building or industrial facility that is independently certified to use less energy and cause fewer of the emissions that contribute to climate change. ENERGY STAR is Canada’s simple choice to save energy, save money and save our environment. For more information about ENERGY STAR, visit www.energystar.gc.ca.